The Philadelphia Baseball Review released its Division-III College Player of the Week awards on Tuesday for the period ending March 31. 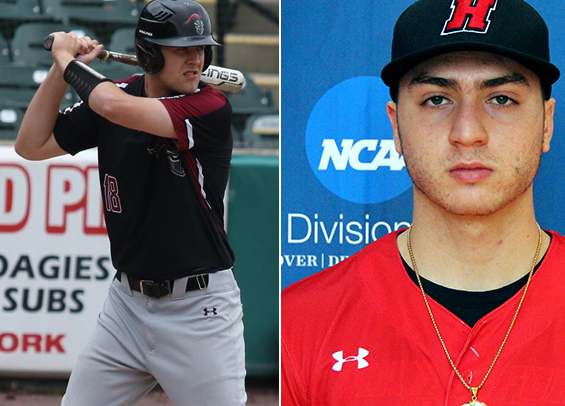 Arcadia senior first baseman Phil Pierfy was named the Philadelphia Baseball Review's D-III Hitter of the Week, while Haverford sophomore right-hander Nathan Bass has been named the Philadelphia Baseball Review's D-III Pitcher of the Week. Pierfy went 13-for-23 (.565) over the week for the Knights, collecting four doubles, a stolen base, and seven RBIs. He also was flawless with the glove, converting on 26 chances in the field without committing an error. For the year, he's hitting .397 with 18 RBIs. As for Bass, he tossed seven shutout innings against Gettysburg and surrendered just three hits while striking out 12. The effort dropped his ERA to just 0.89, tops in the Centennial Conference. He's also struck out 33 in his 20 1/3 innings spread across four appearances this season. The Philadelphia Baseball Review names winners each Tuesday throughout the college season. Founded in 2006, the Philadelphia Baseball Review covers all aspects of baseball in Philadelphia region.